What Would You Do If You Were An Israeli Soldier? Can you imagine the split second, life and death decisions that you would have to make and some of the ethical dilemmas you would face if you were a soldier in the Israel Defense Forces? It is not easy to put yourself in the shoes of an 18-year-old Israeli who has a job to do, often a dangerous and unpleasant one. Put aside for a moment the political issues of whether Israeli policy is right or wrong. As a soldier, you have a job to do independent of the decisions of the government or your own personal beliefs. 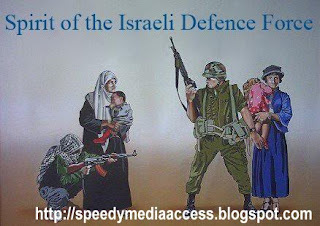 First, and foremost, the job of an Israeli soldier is to defend the citizens of the State of Israel. 1. Military action can only be taken against military targets. 2. The use of force must be proportional. 3. Soldiers may only use weaponry they were issued by the IDF. 4. Anyone who surrenders cannot be attacked. 5. Only those who are properly trained can interrogate prisoners. 6. Soldiers must accord dignity and respect to the Palestinian population and those arrested. 7. Soldiers must give appropriate medical care, when conditions allow, to oneself and one's enemy. 8. Pillaging is absolutely and totally illegal. 9. Soldiers must show proper respect for religious and cultural sites and artifacts. 10. Soldiers must protect international aid workers, including their property and vehicles. 11. Soldiers must report all violations of this code. This is a helpful guide, but you are fighting an enemy that does not play by any rules. Terrorists, for example, may hide behind civilians rather than defend them. They may dress the same way you do, so it is impossible to distinguish people who are dangerous from those who are innocent. These decisions often must be made in a split second. As a soldier, you are taught to kill or be killed. You have little time to decide friend from foe – hesitation could be fatal. If a suicide bomber approaches, for example, a soldier has eight seconds to decide whether or not to shoot. But you must think before acting. A mistake can have catastrophic consequences. Instead of killing the enemy, an innocent person might be harmed as when a UN outpost was accidentally bombed in Lebanon and a mortar round was inaccurately fired into a home in Gaza that killed many innocent people. Mistakes are also often magnified by press coverage so they can have international political repercussions. Some people say that you cannot defeat terrorism militarily. It is not true. It is possible if you are willing to employ extreme measures. In Syria, Islamic fundamentalists threatened the regime of Hafez Assad. His response was to send the army to the town where his opponents were based and destroy the entire city. An estimated 20,000 people were killed in Hama in 1982 and no television cameras recorded the event, no UN condemnations were issued, no Arab spokespeople decried the massacre. The operation did successfully end the threat to Assad’s power. Similarly, King Hussein faced a threat from the PLO, which had established a state within a state in Jordan. When the danger to his throne became acute in 1970, he sent his army to drive Yasser Arafat and his fellow “freedom fighters” out of Jordan in what became known among Palestinians as Black September. More Palestinians were killed in that month of fighting than in all the conflicts with Israel over the last 58 years. Even the United States has not hesitated to use overwhelming force to destroy its enemies. And it too has occasionally made tragic mistakes, as when faulty intelligence led to an airstrike on an Afghan wedding party rather than the group of terrorists it expected. The Allies fire bombed Dresden and the U.S. used nuclear weapons against Japan in World War II. If Israel had no moral code, and did not care how many people died, or how many innocents fell along with the terrorists, it could also put an end to the violence. But Israel does have an ethical code that requires every effort to be made to spare the lives of noncombatants. A) The person carrying a bomb? B) The person who drives the bomber to his destination? C) The engineer who builds the bomb? D) The person who provides money for the bomber or the explosives? E) The Muslim cleric who calls on his followers to kill Jews? F) The person who watches the preacher on TV? Once the decision is made to strike, the ethical code of the IDF says that you must provide a warning to prevent civilian casualties. So, for example, in Lebanon, Israel dropped leaflets in villages warning that it intended to bomb them. What other army would give away the element of surprise and announce to their enemies, We’re coming to get you, run away now, or prepare to fight us? In 2002, Israel learned that the head of the military arm of Hamas was going to be in his apartment and the decision was made to drop a two ton bomb on the building. He was killed, but the intelligence about the surrounding buildings was wrong and many innocent people were also killed, prompting international criticism. A month later, the entire leadership of Hamas was in one room and the IDF knew it would again need a two ton bomb to destroy the building and eliminate all the terrorists. It was akin to the United States learning bin Laden and all his top commanders were in one place. Because of the earlier experience, however, and fear of harming innocents, the army was forced to use a smaller bomb and it did not destroy the building, and all of the terrorists escaped. Sometimes Israel actually places its soldiers in greater danger by adopting strategies to save civilians. In one case, for example, before an attack, soldiers were clearing an area in the Gaza Strip of noncombatants. Two soldiers were helping an old Palestinian woman get some water and were shot by a sniper. In one of the most tragic cases, Israel decided to send troops into the refugee camp in Jenin in 2002 to root out terrorists known to be operating from inside. Israel could have simply dropped a bomb on the area and would have eliminated all the terrorists, but many innocent Palestinians would have been killed. Instead, the decision was made to go house to house and engage the terrorists, who had set up booby-traps and ambushes. In the end, the soldiers successfully completed the operation, but 13 soldiers were killed and 75 were wounded. Now that you have some background on what Israel is up against, it is time to take your place on the front lines and make decisions about what you would do if faced with the type of dilemmas Israeli soldiers face every day. Part 2 - WHAT WOULD YOU DO? 1) At a checkpoint in the West Bank. Your job is to check people and vehicles that are requesting entrance into Israel. On a typical day many Palestinian Arabs cross over from the West Bank into Israel proper, mainly for work and often for medical reasons (many Palestinians use hospitals in Israel). They line up at checkpoints so the Israeli Army can search each person and vehicle to make sure they are not carrying weapons. According to intelligence information you’ve received, an ambulance is expected to arrive with a wanted terrorist in it carrying an explosive belt for a suicide attack against innocent Israeli civilians. Suddenly an ambulance arrives, and inside is a woman who is seemingly pregnant. It has happened at checkpoints that not everybody who appears to be pregnant is truly pregnant. The woman appears to be in pain and her husband is also highly anxious. The ambulance driver says the woman is about to give birth and without the proper medical attention at the hospital, the newborn baby will struggle to survive. To complicate the picture, a news video crew is present. To further complicate the situation, the pregnant woman is a religious Muslim and it is considered disrespectful to touch a religious woman. You are not a doctor, but you have to make a decision. If you let the ambulance go through and it contains a terrorist, then innocent people will die. If there is not a terrorist in this particular ambulance, you may cause the woman to lose her child. The vehicle was stopped and searched and another ambulance was called. 2) You are serving within a commando unit in the southern West Bank, south of Hebron. Your current mission is to infiltrate a small village of about 30 people. There is a suspected terrorist living within this small village who is known to have created explosives for suicide bombings. There is a lot of information and research on this particular terrorist, and his arrest is important for the safety and security of Israeli citizens. Your unit is heading by foot to this hilltop village starting at 5 a.m. On your trek up to the top of the hill, your leader notices an older shepherd from the village on a nearby hill. The shepherd, with his flock of sheep, sees you and your unit approaching the village. The Shepard ends up inflicting some harm though. He warns the village and the operation is compromised. 3) Your unit is called in to respond to a sniper who is shooting from inside a hospital. What do you do? Warn the hospital of your intention to enter and then move in carefully to take out the sniper. 4) You are part of a patrol unit near the Palestinian city of Jenin. Over the past few weeks a thorough investigative research has found a terrorist aide to be living in a small house on the outskirts of Jenin. He is thought to have assisted a few suicide bombers in the making and preparing of their suicide-bomb belts. Your mission is to go to his house, arrest him, and search his home for additional weapons and bomb-making materials. Your unit’s truck approaches his house, enters his home through a side window, and arrests him, avoiding gunfire and confrontation. You order his family to take a few belongings with them for a few hours as the unit has to search the house. The man’s wife and kids reluctantly agree, grab a few items, and slowly exit their home. The wife and kids all leave the home carrying a bag or backpack with a few home items inside. The man’s older son, who is about 4 years old, is crying and requests repeatedly to go over and say goodbye to his father. What do you do? The boy ran away. He was chased and caught. He was carrying dynamite sticks in his backpack. 5) Palestinians terrorists shoot at an Israeli civilian car and you are engaged in a chase. The terrorists flee into a mosque where a prayer service is being held. What do you do? A group of terrorists in Gaza holed up in a mosque and a group of women came and put themselves between the soldiers and the terrorists. The Israelis retreated and the terrorists were allowed to escape. 6) You are driving in a jeep in the West Bank with another soldier and see a Palestinian placing a pile of rocks in the road that you suspect may be booby-trapped. If the soldiers see the Palestinian place the rocks in the road, it is permissible to order the person to remove them. However, if no one is seen placing the rocks, it is forbidden to force a local resident to help move them because civilians cannot be used as human shields.